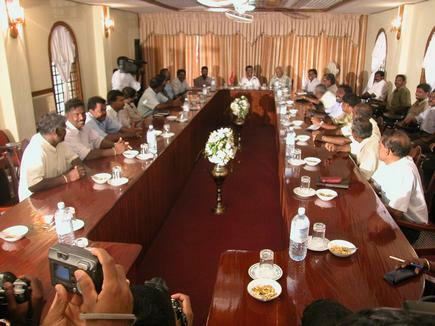 Tamil National Alliance parliamentarians met with Leader of LTTE's Political Wing, S.P.Thamilchelvan Saturday in the LTTE political head quarters in Kilinochchi for a four hour long meeting. The issues and the urgent need for institutionlizing self governance for NorthEast based on LTTE's Interim Self-Governing Authority proposals were discussed in the meeting, , LTTE peace secretariat website said. "The legislators have been briefed on the LTTE view of the government's delay in responding to the facilitator's message on the necessity to take up the ISGA issue as the basis of recommencing the negotiations. The parliamentarians have been provided with guidelines to work within and outside the parliament giving due considerations to the mandate of the Tamil people," said Thamilchelvan according to the report. Twenty-one TNA parliamentarians participated in the discussion, which commenced around 11 a.m. Vanni district parliamentarian Mr.Selvam Adaikalanathan did not attend the discussion as he was out of the country, TNA sources said. District Political Heads of LTTE also participated in the discussion, the sources said.